Back in March my chapter on material culture for the Wiley-Blackwell Companion to Mediterranean History came out. It was a challenging exercise to condense into 8000 words the essence of the study of material culture in a Mediterranean geo-historical context and also to represent all periods of human history at the same time. I have always been interested in the making and circulation of objects and this interest has never really obeyed traditional geographic or period boundaries. I feel as comfortable analysing an inventory of a 12th-century monastic treasury as I do trawling through 19th century order books. I know my way around early medieval metalwork as much as I do modern souvenirs in social history collections. My background in museology has without doubt influenced my points of view and perceptions. As someone professionally involved in the presentation and interpretation of artefacts I am responsible for finding out what stories objects can tell, while also presenting a lens on the world through human creativity and productivity. 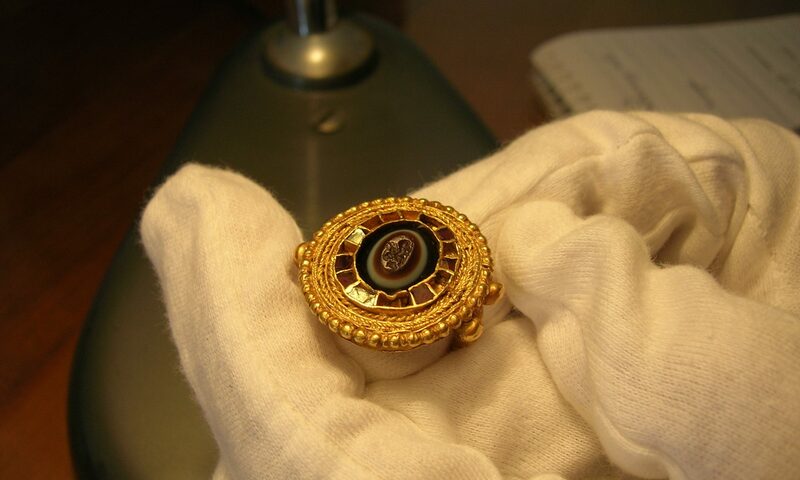 Finger ring, reusing a late Roman agate seal, from southern Italy, late 7th century (credit: Museo Nazionale Archeologico di Napoli). The creation and use of complex tools are distinguishing traits of the human animal. As such, material culture is intrinsic to the humanities, whether approached through archaeology, anthropology, history, art or museology. Fundamentally this chapter attempts to blow apart academic tendencies to narrow down–but this doesn’t mean that it eschews detail and depth. It provides food for thought on how we understand people’s relationships with things, with production and with consumption. That the basic need for humans to have and exchange commodities is as crucial to life as food and water. Most studies of material culture tend to speak in non-human terms, are clinical and distant from experience, or otherwise concerned with artistic conceits. 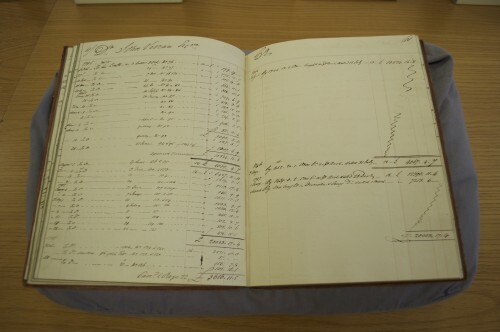 Ore procurement book of Grenfell and Co. copper company (credit: Centre for Buckinghamshire Studies, Aylesbury). I was inspired in part by Fernand Braudel’s approach to studying and comparing economic and material life, and in part the seminal work edited by Arjun Appadurai, The Social Life of Things. The abstract to my chapter explains its contents. This chapter explores how the study of material culture illuminates Mediterranean history in new ways. Early discoveries in the Mediterranean influenced the development of material culture studies from archaeological classification to the phenomenon of making collections of classical artefacts during the Grand Tour which formed the basis of modern museums. Taking inspiration from Braudel’s other paradigm on the inter-relationship between economic and material life, this chapter then presents a series of vignettes on the materiality of eating, sitting and sleeping, which address how and why Mediterranean object cultures should be perceived in a globally-comparative context. 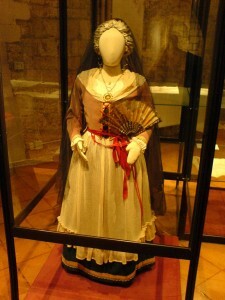 There follow three epochal studies that apply Braudel’s global approach as well as object biography and documentary reconstruction to provide new perspectives on the prehistoric, ancient, medieval, early modern, modern and contemporary Mediterranean, taking examples from ceramics, the copper industry, the consumption of silk, textile conservation, souvenirs and mass craft manufacturing. 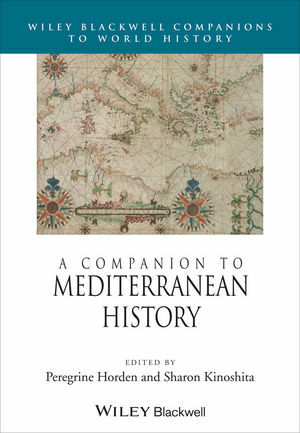 A Companion to Mediterranean History, part of Wiley Blackwell’s acclaimed Companions to History series has just been published. The book project, led by editors Peregrine Horden and Sharon Kinoshita, is a culmination of at least three years’ work and a coming together of 29 contributors from across the world. Each contributor is a specialist in their field, but we are united by an interest, for some a vocation, in testing the Mediterranean paradigm as a way of interrogating the history of the region (including the sea itself) in a meaningful and coherent way. From climate to nautical technology, and cave dwelling to language, this volume is trailblaizes themes in history unfettered by the conventional parameters of the accepted canons of period, place and politics, or indeed disciplinary expectations. It is a great credit to the editors that they have succeeded in bringing together such diverse scholars of varying experience, approaches and opinions and produced a coherent and thought-provoking book that will surely be argued over (we hope) by scholars and students alike. My contribution was the chapter on material culture from prehistory to now, on which I will be writing a separate blog post. Mediterranean history has never been more widely debated or practised, yet there remains no consensus about precisely how this history should be written, the definition of its parameters, or the breadth of topics it should include. In summarising the latest scholarship and reappraising key concepts, contributors to this volume enable fruitful interdisciplinary dialogue on subjects ranging from climate and cartography to material culture and heritage politics. A Companion to Mediterranean History represents an invaluable guide to the current state of Mediterranean scholarship that will also help to redefine the field for a new generation. RRP £120 Hardcover, £99.99 Ebook. In September I was commissioned to help develop and create content for a digital history of Cornwall through its objects alla History of the World in 100 Objects format and fame. A booklet of 100 objects chosen from collections across Cornwall’s museums had already been created by Museum Development Officers showcasing everything from a cork model of St Michael’s Mount made by one of its butlers and on show there, to a commemorative football medal from Mexico. The booklet had enjoyed limited circulation, and in particular, did not make much of an impact on audiences that did not visit museums and heritage sites in Cornwall. This was an exercise in writing for the web and exhibition interpretation. Using pre-selected (or curated) objects chosen by the museums themselves I was challenged with writing the stories that linked them together — some more seamlessly than others. Some objects appeared within more than one story while others found a place in some more unexpected themes such as Cornish Journeys or Customs but I think these work better than the more pedestrian, War, Mining and Sport. It’s an alternative history of Cornwall. It takes a long time to get to Cornwall from most places in Britain, whether by road, rail or air. Until the introduction of motorised transport most Cornish people walked the long distance to get from town to town, or from home to work. Many of the surviving waymarking crosses we see scattered across our landscape still mark the ancient routes that people used. Read more from Cornish Journeys. At heart, I am a creative organiser of information which makes me deeply sensitive to the dull ways in which many museums and academics categorise and class collections. One entire section of my PhD thesis was a critique of taxonomy arguing that although the common language of classification helps scholars and researchers share information (like a common metadata standard) ultimately the structural interpretation of our material culture can be a major barrier to wider understanding–yes it’s about our audiences. The History of Cornwall Through its Objects was therefore an attempt to blend the expected and the unexpected together. To tell new stories from Cornish heritage as well as reassure by telling favoured stories perhaps in a new way. I’m not sure this piece of digital heritage has succeeded particularly well. I have no idea of the analytics or even who is using it or coming across it. I have my doubts about its discoverability. The CMS that structured the data was quirky and bizarre to say the least but I can hope that the content will live on and somewhere out there it will fascinate people who love Cornwall and Cornish history. Earlier in the year I spent some weeks in the summer researching and writing a survey of the links between Cornwall and South Wales, particularly those evidenced in the metal industries of copper, iron and steel, and tin. 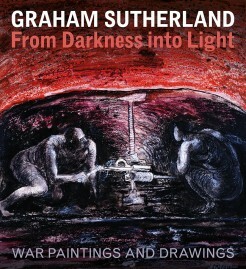 It resulted in a wonderfully illustrated book called Graham Sutherland: From Darkness Into Light. War Paintings and Drawings, co-authored with Sally Moss and Paul Gough, and published by Sansom and Company. Buy the book. RRP. £17.95. Read Made in Metal in preprint version on my Academia.edu site. it is not often that you will find modern art discussed in equal measure to the historical context of its subjects. I was delighted to hear on Friday that I had been successful in my application for a small research grant from Glamorgan County History Trust for continued research on my project entitled, Biographies of British copper: The heritage of a global commodity, c.1700-1980. The Trust supports research into any aspect of the history of Glamorgan, south Wales. The specific aspect of my research this funding will benefit is for further work into business archives relating to the copper industry found in Bangor University Archives. Following my survey of copper business archives held in Swansea, I identified related papers held in Bangor which not only have direct relevance to understanding the supply chain between mines and the Glamorgan smelters but also to further my knowledge about how the Grenfells operated during the formative 1800-1830s period. The key relation to the Swansea Grenfell Collection are the records in the Williams and Grenfell Copper Smelting Firm collection, 1829-34, held at Bangor University Archives. I will use the grant to enable me to travel to Bangor and study the records and then use copied material for furthering this project in subsequent months. Having already consulted the small number of business records relating to the early years of Grenfell involvement as mine agents and speculators in the Centre for Buckinghamshire Studies in Aylesbury last winter, this will be a crucial stage in gathering evidence for reconstructing supply chain information through the development of one company. The most valuable part of these fonds are twelve bundles of ticketing documents dating 1829-34 which document a formative period in the growth of the copper industry and the centralisation of smelting and refining processes in Glamorgan, especially Swansea. These documents are rare survivals which have hitherto escaped the attention of scholars. They bear testimony to the business negotiations that took place between smelters’ agents (overwhelmingly based in Swansea, Neath and Llanelli) and mine companies. The ticketing events took place in Cornwall (Redruth) for Cornish ores and in Swansea for the sale of Welsh, Irish and foreign ores. While statistical synopses are available for this period in contemporary editions of the Mining Journal and other serials, analyses of these documents will enable me to map actual relationships between specific mining companies and smelting concerns. It will also help to establish how the supply chain centred in Swansea compared with that of Cornwall. Combining this new research with that I have already undertaken on the Swansea and Buckinghamshire documents, I hope to publish an article on these archives that will also highlight their value as sources for understanding the nature of how business was done and also more about how industrial history can be better appreciated through tracing the biographies of the commodities themselves. Following the discussion of some of the themes I have been exploring related to the historic copper industry through the lens of business archives, I have begun to think more holistically about the relationships between place-industry-business-commodity. My recent relocation to West Cornwall put me in mind of its world-class mining heritage and a landscape and society shaped by the demand for the commodities of copper, tin, and other minerals particularly during the 18th to early 20th centuries. Mining history is the staple of industrial heritage in Cornwall and Britain as a whole and mining landscapes in the rest of the world are beginning to receive similar attention, such as in South Africa and Australia. But from the perspective of a material culture historian, mining is only part of the story and it has surprised me so far that both scholarly publications and public interpretation has largely been cursory in its treatment of ‘what happened to all that copper, or tin…?’ Those who appreciate the value of biography as an epistemological tool (or theoretical framework) will have a natural desire to follow a commodity through the whole materials cycle. Historical studies of business and industry tend to compartmentalise one or two aspects of the historic materials cycle. Those that deal with the whole will usually privilege one stage, e.g. mining and extraction or smelting over others. This is particularly the case with the history of metals and metallurgical processes. It was with this in mind that I have begun to hammer out a plan to research copper through several of its materials cycles to try and understand how the supply chain operated, the skills involved, which individuals and companies were connected together (current work on historic social networks will come in handy here) and how changes in demand and technology manifested themselves in this cycle. I described some of the ways I have been using business archives to at a recent workshop on the value of business archives in research, held at Swansea University and organised by the Powering the World project. In this paper I suggested that focusing on a firm that dealt with buying raw materials for smelting and refining copper and then supplying its products to onward manufacturing industries was an effective way to exploit the full potential of business archives held in local and specialist collections. Pascoe Grenfell and Sons is one of the firms I am most interested in. Not having been the subject of any major study, PG&S’s activities spanned mining, smelting, refining, transport and part manufacture of copper and brass. Archives related to their business concerns spanning the late 18th to late 19th centuries can be found in Swansea, London, Cornwall, Aylesbury, Birmingham and beyond. They illustrate the huge complexity and balances required in the procurement of materials to produce saleable commodities. 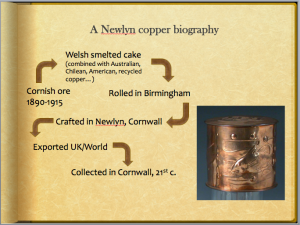 An example I gave of constructing a biography of copper was of craft copper, such as developed in Newlyn at the end of the 19th century. It’s very schematic and only intended to illustrate the idea of looking at materials cycles. Determining accurate percentages of actual Cornish copper in what was crafted in Newlyn and elsewhere is of course an impossible question to answer at the moment. Also bearing in mind that it is estimated that 80% of copper ever mined is still somewhere in use today, the study of materials cycles become even more compelling. I wrote this short essay for a hypothetical radio programme when I applied to the BBC Radio 3/AHRC New Generation Thinkers competition in December 2010. I was fortunate enough to be chosen as a finalist out of over 1000 applicants and attend a thought-provoking workshop. Although I did not make the final ten I wanted to share the work I prepared for the competition here. 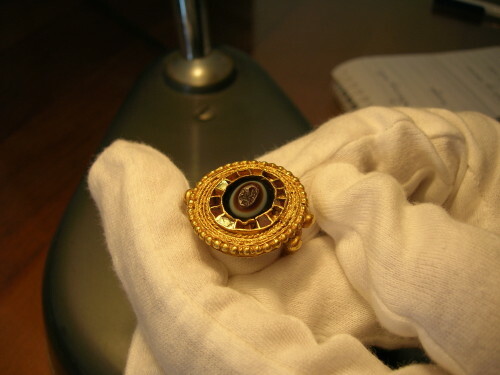 Next I will post my idea for a radio series on the history of copper. My morning breaks will never be the same again. The small steel teaspoon chimes, rather than clinks, as I stir together frothy milk and velveteen coffee in my new Leach Pottery cup. As I stare longingly at the ever-decreasing swirls I remember my visit to the Leach Pottery Studio and Museum in St Ives, Cornwall. The burnished yellow ochre glaze, the exquisite lip and the pleasing weight of the finely turned stoneware has placed 90 years of British studio pottery into my hands. An unpromising walk from the centre of town brings you to an equally unpromising house at Higher Stennack. But don’t be discouraged. Venture in and you too will become students of the two most significant pioneers of artist pottery: Bernard Leach and Shoji Hamada. 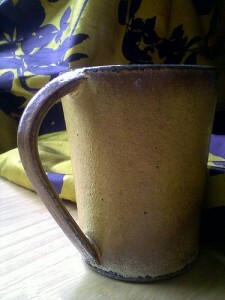 The pair established the pottery in 1920 after they met while Leach was an apprentice potter in Japan. As you step quietly around the recently restored studio and galleries, around the climbing kiln and along the delicate wooden platforms you can’t fail to become absorbed in the ideals of functional beauty that Leach spent so many years learning and teaching. The early decades of studio pottery in Britain embodied a marriage of philosophy and thought from east and west. While wandering around the galleries you begin to learn how to read the pots. They were not just exquisite to look at. Leach created objects that were statements against the shallow conceits of many fine art ceramics. Now I could begin to understand what he meant by the standard forms of unity, spontaneity and simplicity (explained in “A Potter’s Book,” 1940). There is enlightenment in simple design, colour, texture and shape. This museum is dedicated to keeping this philosophy alive and so who could resist bringing some of it back home? In Autumn 2008 I reviewed Pieter ter Keurs’s book Condensed Reality. 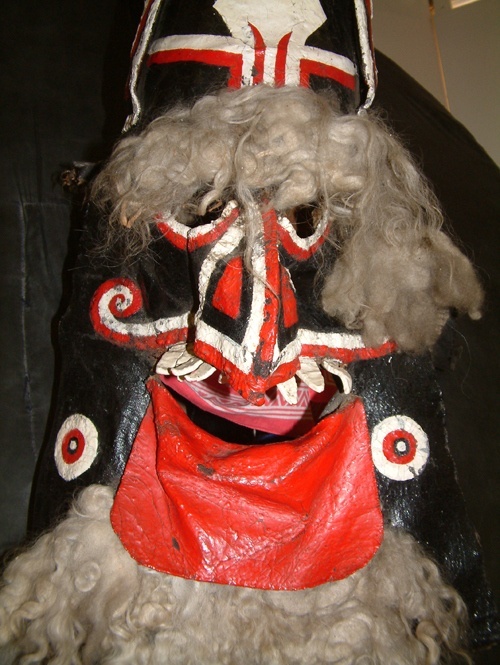 A Study of Material Culture (Leiden: CNWS Publications, 2006) for the Journal of Museum Ethnography. Unfortunately due to problems with at the journal’s end the issue which was meant to hold the review has still not appeared. As it is now so long since I wrote the review, and longer since the book was published, I felt it was of benefit to other researchers if I published it here on my website. This book was a genuinely fascinating read. As I note at the start of the review it is not only of interest to ethnographers and curators with an interest in Papua New Guinea and Indonesia but worthwhile for any scholar of material culture. Pieter ter Keurs is curator for Indonesian collections at the National Museum of Ethnology (Rijksmuseum voor Volkenkunde) in Leiden, the Netherlands and the book rose out of his doctoral thesis. His case-studies bring together fieldwork conducted in the Siassi Islands of Papua New Guinea in the early 1980s and on the Enggano in 1994. Download and read Review: Pieter ter Keurs, Condensed Reality. A Study of Material Culture (2006) by Tehmina Goskar. On Thursday 16 December at 4pm I shall be giving a paper to this title for the Centre for the Comparative Study of the Americas (CECSAM) at Swansea University. This will be the first time I have delved into a brand new region’s material culture since my foray into medieval southern Italy for my PhD. My learning curve has been steep and I hope that I do justice to the work of scholars of Latin America on which I will be heavily relying. However, this paper will not be about Wales’ relationship with Latin America during the boom years of the world copper industry in the middle two-thirds of the 19th century, but will rather suggest how this relationship can be interpreted through objects. Through the project I am currently working on, the Global and Local Worlds of Welsh Copper, I am tasked with doing just this. It isn’t just the Latin American connections that need to be made tangible through the objects and illustrations we will feature in the forthcoming exhibition at the National Waterfront Museum in Swansea in July 2011, but those closer and farther from Wales such as Australia, South Africa, Anglesey and Cornwall. How can this story be told through the things that remain to us? Copper wasn’t the only thing that connected Latin America to Wales. 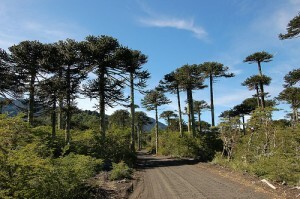 The well-known Monkey-puzzle tree (Araucaria araucana, previously known as Chile Pine in Britain), native to Chile and Argentina, came to the British Isles in the 1850s and a handsome specimen was planted in the estates of Singleton Abbey, previously the home of copper magnates the Vivians, now the core of Swansea University. Did the copper connection bring this particular one to Swansea? This paper will give me the opportunity to talk about my intellectual approach to choosing objects for exhibitions (and for history writing) and provide a discrete case-study to do this. To be a little out of my comfort zone with a new region’s history will sharpen, I hope, my questions and improve my answers. The title is in homage to copper’s elemental number, 29, and my expectation that 29 key objects can tell the story of the world of Welsh copper. An enhanced version of my slideshow presentation will now form a part of the 2011 Swansea Latin American Association (Asociación Latinoamericana de Swansea Swansea Latin American Association) festival at the Dylan Thomas Centre where people will be able to learn about the Welsh-Latin American copper connections.